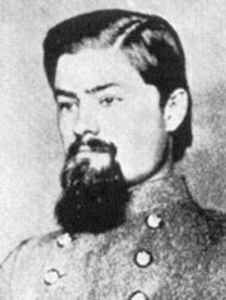 Kentuckian by birth, Basil Wilson Duke was practicing law in Missouri when he became a leader of a pro-Southern faction in St. Louis known as the Minute Men. In 1861, he married Henrietta Morgan, a sister of John Hunt Morgan. During most of the Civil War he was Morgan’s second in command, and succeeded Morgan upon the latter’s death. He was author of a History of Morgan’s Cavalry and a volume of Reminiscences. He served in the Kentucky House of Representatives and had a distinguished legal career.